When you’re auctioning something as expensive as a motor vehicle on eBay, the appearance of the listing becomes a pretty big deal. Don’t believe us? Think about it from the buyer’s perspective. Most people aren’t willing to spend thousands of dollars on something they haven’t gotten a good look at, so you’ll need at at least 10 good pictures of the vehicle. But how do you arrange those picture neatly and accessibly, without making your listing look disjointed? How do you create the impression that you’re a reputable business with plenty of experience in online sales, as opposed to some guy with a digital camera? Sharp, consistent design is the answer. And WebManager‘s template system for eBay achieves it. In order to post to eBay, you first need to choose the eBay template you want to use for all your listings. 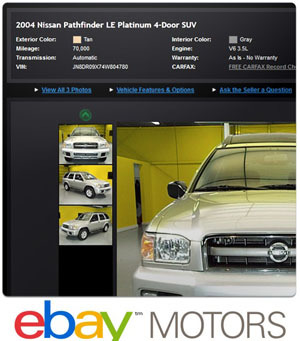 From the WebManager dashboard, hover over Settings, then hover over Auctions, then click on eBay Listing Template. From the eBay Listing Template page, you will be able to choose the elements that are on your eBay listing. To include an element in your eBay listing, check the checkbox next to that element. To take an element off of your eBay listing, uncheck the checkbox next to the element. You can also rearrange elements on your listing by dragging and dropping the elements into the order you would like them to appear. Each of the elements on your listing has settings that are specific to that element. To change the settings on an element, simply click Settings to the right of the element you would like to edit. To preview the listing at any time, click on the Preview Listing button. When you are done, click on the Save Changes button. After you save your changes, you will be able to post to eBay.